Get quick relief from burning muscle and joint pain with the Rub A535 Ice Spray. 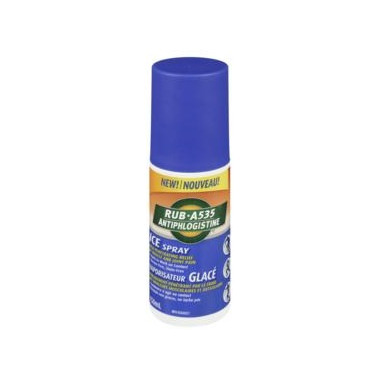 With 75% more medicinal ingredient, Rub A535 Ice Spray provides cold, penetrating relief of muscle and joint pain in a stainless, and greaseless formula. The spray format is easier to apply on hard to reach areas plus it’s portable for convenient on-the-go use. Use before, during or after exercise to provide cool, temporary relief of stiff and sore muscles, back pain, strains, sprains and joint and arthritic pain. It starts to work on contact – exactly where you need it. Feel the relief today! A great product! Really works to relieve pain and stiffness. Easy to use. None of my local stores carry this so I'm thrilled Well.ca does! this product has become hard to find at the drugstore, so we were pleased to see it here, and bought two bottles.